The perfect choice for applications when multiple temperature measurements are needed. Features include: LCD backlight for dark environments; sealed keypad which protects the instrument from spills and dust; and a battery eliminator jack. It simultaneously measures suction and liquid line temperatures, temperatures across condensing coils, evaporator coils and ambient temperatures. View temperature differential between zones 1 and 2 and review min / max temperatures from all three zones. 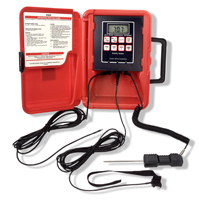 The SH66A-E-NIST includes the #1075 general purpose probe, #2010 Air Probe and #4011 pipe strap probe. 220 TruReward$ points will be placed in your account when you buy this item.